Travel in style by staying at one of Marriotts premier lodging addresses downtown San Antonio, the SpringHill Suites by Marriott San Antonio Downtown/Riverwalk Area. This all-suite hotel seamlessly blends design and functionality with modern amenities you need to stay refreshed and focused, all at an affordable price. Enjoy free Wi-Fi and a signature drink in our lobby bar. Spacious suites and our vibrant lobby offer flexible spaces perfect for working, meeting or relaxing. Our Market is open 24/7 for snacks and necessities. Lite evening fare is on the menu in our comfortable lobby bar. 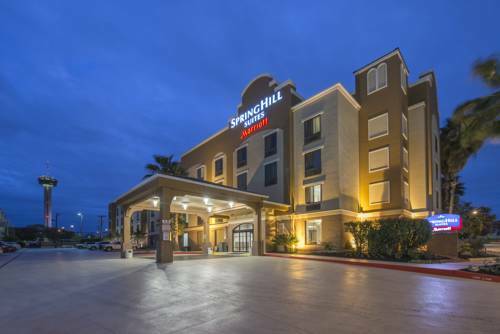 This downtown San Antonio hotel features a customized SpringHill Suites by Marriott complimentary breakfast with fresh choices to start your day. Choose healthy and indulging items, like eggs with local salsa to Greek yogurt and oatmeal complete with a toppings bar. Quite simply, from business trips to leisurely journeys, SpringHill Suites by Marriott San Antonio Downtown/Riverwalk Area is a breath of fresh air.